4G speeds continue to grow in the UK as EE trial LTE-A 300Mbps. Sat in an interesting talk at UKNOF27 given by Bob Sleigh of EE. You will know that EE were the first of the mobile operators to sell 4G services in the UK. Bob told us that by the end of 2013 EE 4G services have reached 66% of the UK population with 98% potentially covered by the end of 2014. This represents the fastest rollout of 4G services in any country anywhere and EE now claim that the UK has moved from a mobile backwater to one of the world’s leading implementers. This claim of world leadership is likely to be on the back of EE’s Techcity LTE-Advanced (LTE-A) trials (November 2013) which saw maximum 4G speeds of 296Mbps. 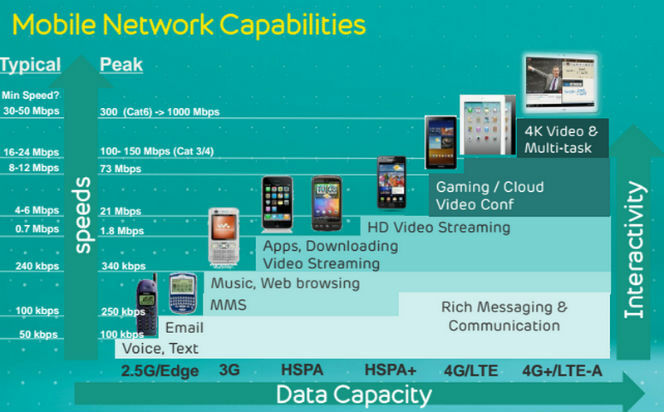 EE expect to roll out LTE-A services in 2014. I did ask about the market for such high speed mobile services, especially considering that to obtain such speeds must consume a significant amount of the available spectrum at any cell site. After all you aren’t going to need 300Mbps on your mobile phone. The answer is of course business. For example when you see live news reports streamed from a location – live coverage of incidents in London say – these are typically streamed over 4G networks. The demand from this type of customer is going to increase as technologies such as 8K become available. The chart below, taken from Bob Sleigh’s presentation, is a really good illustration of the mobile technology roadmap. You can see that today we are at typical 4G speeds of 16 – 24Mbps with a max achievable 100 – 150Mbps. EE quoted 20Mbps for a 4K video stream (this is subject to debate) which suggests that LTE-A is needed with it’s higher typical speeds of 30 – 50Mbps. EE expect to introduce LTE-A to commercial deployment in 2014. Presumably the first customers will be London based media organisations. The issue of providing customers with a good Quality of Experience when streaming video is something the industry is trying to get to grips with. There are a lot of technology stakeholders involved in the whole ecosystem. A good example of why this is a problem can be seen in the above photo of growth in mobile bandwidth usage at football matches. 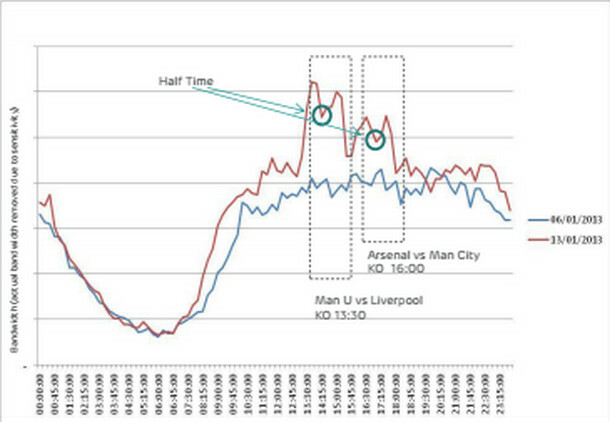 The chart shows EE network bandwidth usage in Manchester during two premiership matches – Manchester United versus Liverpool and Arsenal v Manchester City. The red line represents the usage on match day and the blue the previous week where no games were being played. EE have removed the Y scale but we only need to compare the two. Interesting to see people start to watch sport streaming on their mobile devices whilst the games are in play and the dip at half time as people presumably left the advertising and “expert commentary” and went to get a cup of tea. 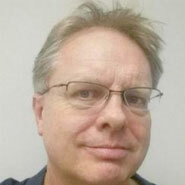 The point is that this type of event is driving use of video over the mobile networks. Mobile video is still pretty inflexible. When you watch BBC iPlayer the video stream rate adapts to fit the bandwidth available. Mobile video historically doesn’t do this even though it’s an obvious thing to do. Mobile networks like certainty and use of adaptive codecs means that they won’t know how much bandwidth to serve per stream – they need to keep a handle on capacity demand. Progress is being made. For example use of the HEVC (High Efficiency Video Coding) has halved the bandwidth used by previous incumbent AVC (Advanced Video Coding) codec. One the other hand as the bearer technology gets faster (LTE-A) people want to stream higher quality video such as 4K which eats up any savings achieved by using HEVC. The punters aren’t of course interested in the detail of how it works. They just want to watch the video. The man in the street is also unlikely to be using LTE-A anytime soon although they may well watch the news streamed using the technology. It is however nice to be able to look at technology developments in the UK and see that we are beginning to compete again globally. With today’s BT announcement re the 1.4Tbps routing over fibre it’s a good time to be in the connectivity industry in the UK. The live streaming by media organisations is fine, and for live coverage there is generally a much greater tolerance from viewers for lower quality encoding/picture. BT updated its SINET for a HD-SDI over fibre which includes a 3 Gbps option for uncompressed 1080p HD. More suited to permanent links between large broadcasting centres, but it shows the scale to be climbed before we hit the quality ceiling even for lowly 1920×1080 resolution. Now which step do I need to stand on the stairs to get my 8 Kilo bit per second GPRS signal? And if you did get 300 Mbps the battery would probably last for, ooh, 20 seconds not to mention the heat generated. I can definitely see the appeal of the speed but as I have said before I think that once 4G takes off we might again see grumbles about speed in places like London and as a mod on a (now defunct) mobile tech related forum a lot of the complaints were about speed. As fixed broadband is so variable in the UK I suspect there will be strong take up in slow broadband areas and people will be using it for what they would use fixed broadband for which will kill it, particularly if you get a few hundred P2P sessions on there serving and downloading at maximum speed. I think the operators will have to have to carefully traffic manage. Can’t see the mobile operators allowing p2p. It would probably also be uneconomic for the end user. Provided they don’t introduce ‘unlimited’ plans. They won’t be providing unlimited plans – they’ve been stung by them in the past.